James Bowman was a purebred cattle herder living on Paisley Road on the western outskirts of Guelph, Writing'over twelve volumes during his lifetime between 1866 and 1944, his diaries are now housed and available for viewing at the University of Guelph Mclaughlin Library Archives, including around 240 pages of Bowmant diaries written during the First World War. What role did a Guelph purebred cattle breeder play in the wartime cattle economy? The war accelerated cattle breeders place in Canada's complex rural hierarchy. Guelph's farmers were expert hobbyists, making a living from the professionalization of exhibition prizes. On I July 1914, Bowman and his hired men loaded his animal stock from his farm near Guelph onto his combination wagon and hauled them offto the Grand Trunk Railyard ready to be shipped to the Prairies for his annual trip across the national exhibition circuit. Arriving first at Toronto, they then boarded the Canadian Pacifrc Railway (CPR) heading to Winnipeg, Regina, and Saskatoon. Bowman was the first creator of records for the Aberdeen Angus breed for the Aberdeen Angus Association, and his cattle were among the most prizdd at local and national exhibitions.' He also owned Clydesdale horses and one of the largest flocks of Suffolk sheep in Ontario. Purebred farmers were at the top of the cattle raising hierarchy. While rising meat costs ultimately provided a profrtable source of income to Guelph cattle raisers, the Great War also brought about years of intensive labour, uncertaint¡ and the feeling of 'harder times. '1 Employing a choppy and conversational tone, James Bowman's diaries reveal a day-to-day synopsis of how Guelph farmers sought to improve their frnancial and social standing, but also how they bound together to create a delicate balance between business, family and community to endure wartime conditions. Using the diary of James Bowman, this project examines the relationship between Bowmant business ties and business identity during the First World War. Elm Park, home of the Bowman fmily, purchased by James Bowman in 1895. The property was originally known as Maxwelton when it was built in 1848 by Thomas Sandilmds. Eln Park al646 Pusley Road West wæ designated under the Ontorio Heritage Act ln 2000. Image courtesy of the Planning Department, City of Guelph. Bowman's travels across the continent's exhibition circuit were highly rewarding, seen here with 'Kyma's Heir' one of his many award winners. Image courtesy of Archives and Special Collections, University of Guelph (XRlMSA737). Margaret Derry has written the most extensive study on cattle exchange in Canada in recent years. In her Ontario Cattle Kngdom, she revises the misconception that the heart of cattle breeding in Canada were the Prairies. Despite CPR marketing pamphleteers saturating Canadians' sense of rural space with images of the West's acres of grain fields and cattle ranches, the reality remained; Ontario was the seat of Canadat cattle breeding. In 1914, Ontario accounted for over half the shorthorn breeders in the country.11 When the war began, mix dairy breeds were all that most Western cattle herders could afford. These scrub cattle were mostly sold on the meat market, snubbed by consumers for their cheap, tough, and inferior eating quality. Agricultural 'experts' attempted to convince Westerners that purebreds could offer superior quality product and greater profits if only they invested in the outlay. Their aim was the removal of bld brindle,' the metaphorical replacement of scrubs by purebreds. As the narrative went, bld brindle' had done Canada's farmers well, but even the'sweetest old girls' had to go sometime. Western feeders responded, arguing that purebreds needed to do more than fulfrll the interests of exhibition hobbyists. Although they accepted that purebreds were of a higher sort of quality, they were less convinced that purebreds necessarily offered more in the way of herd improvement, and until expert breeders in central Canada made their cattle more accessible to lower income farmers, only wealthier feeders out West found the venture attractive.12 The result was that many Western feeders had difficulty challenging the dominance of Eastern feeders in the cattle trade, it did not best reflect those agriculturalists who fared better financially. Through the cattle cycle, purebred breeders like Bowman often held of on selling their cattle until they birthed a replacement, meaning prices only spiraled. Profiteers came from a diverse range of backgrounds. Each of Bowman's diary demonstrates intricate craftsmanship; tall, leather bound, with ivory coloured pages. The fore edges have rainbow effects, and each has the word 'logbook gold inlayed into the cover. Bowman did the majority of the diary writing. Either Bowmant wife, Mary fane, or his mother Elizabeth took over while he was away. Bowman had four daughters, Jenn¡ Bessie, Mary, and Marguerite, hence relying on his nephews for heavy work around the farm.15 Without being transcribed, one of the greatest physical obstacles of the diaries is the pace they can be read. It is also rare for Bowman to provide enough details to gain a great deal of context at first glance. Often one is left to rely on multiple entries and other materials. A man of few words, Bowman shortens and skips words for quicker entries. His cursive text glides beautifully across the page, but depending on the breadth of his pen, his writing ranges from difficult to illegible. On the whole, his entries are concise, providing only essential information, likely to save time around the farm or to get some reading in after a long day. At first glance, Bowman appears a typical Methodist cattle breeder from rural Ontario. It's only when delving deep into Bowmant pages that a much more colourful story begins to unfold. The primary limitation of diary writing as historical evidence is that the diarist only tells readers what they choose to disclose. There is no asking, only listening. Bowman's family and farming tasks make up the bulk of his writing, though they often lacked a great level of detail. He describes Harry and Willie chopping and piling wood, trimming the sheep, washing the cattle, and threshing and hauling hay and manure. How long they spent on each activity or how much each contributed to the running of the farm is seldom mentioned. Profiteers came from all walks of life. The First World War's complex social restructuring of Canadian society had rapidly increased purebred breeders' importance to the Canadian war effort. Beyond census information, Bowman never mentions his assets in any great detail. He briefly mentions purchasing cattle from time-to-time. Cattle went for between $350 and $750 during the war, with purebreds going for the most. On 24 September 1918, Bowman went to the Fergus Exhibition and managed to sell one of his bulls for $550. A few days later near Toronto, he bought a young bull for $150, an old bull for $250, and sold one of his own for $400.21 The lack ofavailable financial records is the biggest obstacle to discerning the fluctuations of Bowman's bank balance. The entirety of his propert¡ including his estate, farm animals, crops, and other assets at any single time is left to speculation. The writings of others in the diary do little to shed greater light on the family's finances. Although Bowman is the one to write most often, others tended to offer even briefer descriptions of the life on the farm when Bowman was away, Instead, readers are forced to assume that Bowman's lavish home expenditures are indicative of extra income. Bowmant participation in acts of conspicuous consumption and interest in technological improvements were increased as a result of the wartime economy. In March 1914, Bowman went into town to strike a deal on installing electricity and lighting at Elm Park. After two visits, Bowman came home disappointed, saying that the pricing was too expensive. Instead, he settled on building a large veranda, likely believing he could install electricity more cheaply in the coming years. Besides, he believed his family could make more use out of the veranda. And so, from March through to August, Bowman had three different companies aid in its construction. In March, there was Mr. W Frye Colwill, the architect. He finished his design the next month. Next was Mr. Croft, who came by the farm with his men between May and June to put down the foundations. Last was Mr. Hambridge, who did the same, though this time in August to put up the beams. Harry and Willie hauled the gravel and cement for construction, as well as supervising the men while Bowman was away.22 Later in the war, Bowman no longer travelled by horse to distant areas of Ontario, but instead hired Mr. Anderson to take him to Aberfoyle and Barrie in his new car.23 While committed to daily life on the farm, Methodist teachings, and family relations, Bowman still found time away from the farm for prospective commercial opportunities, shows and exhibitions, and business ventures. Farmers like Bowman were businessmen, establishing contracts and secure deals with an interested clientele. In February 1915, Bowman left for Toronto to attend the annual meeting of the Cattle Breeders Association. The streets would have been bus¡ with tall storied buildings towering over him, and more new automobiles than Bowman would have ever seen back home. During the meeting, greater sales, prizes, and profits were Bowman's primary concerns. He was a main backer of the decision to schedule November as the second month for cattle cars to be sent out West.2a Bowman returned to Toronto again just two days later, this time staying overnight at the King Edward Hotel to attend a'patriotism and production meeting.' The large doorway of the hotel gave way to a rounded neo- classical interior. Marble columns in Corinthian-style raised to the ceiling where dozens of Union facks hung from the walls. In the banquet halls, chandeliers hung above white linen tables. Dressed in his'Sunday besti Bowman sat among Canada's leading government officials, industrialists, and agriculturalists. He was likely familiar with many of them. As he listened to speakers discussing the important role each of them played in doing their part for the British Empire, Bowman was very mucl a businessman among businessmen. That same year he attended meetings and donated to the Canadian Patriotic Fund, Guelph Agricultural Society, and Guelph's 'Committee of l00j a coumminty association composed of 100 influential municipal leaders, businessmen, and public figures in the city. 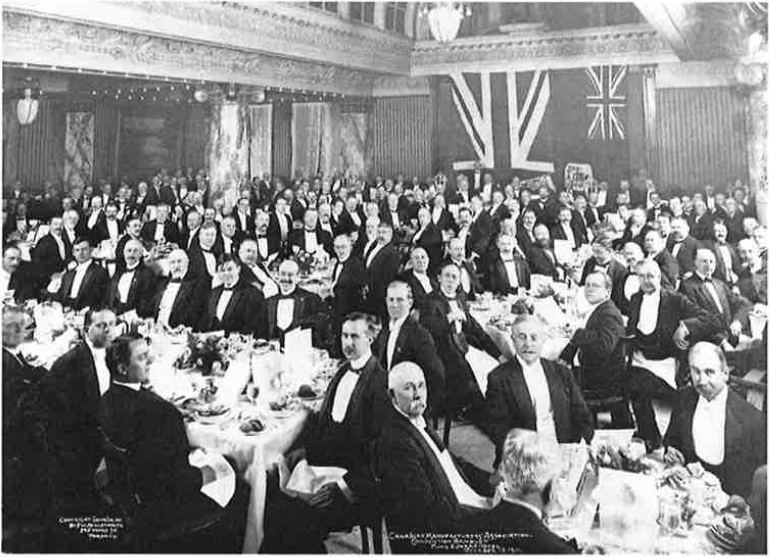 Like here at the 1911 convention of the Canadian Manufacturers Association, The King Edward Hotel ms reserved for the meeting of the country's elites. Union Jack md Canadian Red Ensign hang from the stagebehind.. Image courtesy of Library and Archives Canada (R927 1 -5 -2 -E). Bowman also attended the Guelph Fat Stock Club, which met every few weeks. Meetings and events translated into greater coordination for foods being sent overseas. The rumble of artillery an ocean away strengthened both Bowman's sense of urgency and patriotism.25 Groups dedicated to societal reforms were more proactive during wartime, providing farming communities with the services required to establish contacts and build networks necessary to pursue their business ties. Bad weather was not enough to break up the band of dedicated cattlemen. The Fat Stock Association cm be seen here outside of Guelph's Albion Hotel for their Winter meetiîg.Image courtesy of Guelph Museums (2014.84.344). Bowman had a good frnancial year in 1915, selling and buying a number of show cattle, along with acquiring a few black Angus to keep for breeding. More good news was on the way as Bowman's meeting with the Cattle Breeders'Association the previous year had been proved a success. The Association began making arrangements with the CPR to sponsor trips out West for that November. Leaving on July 9, Bowman did not return until mid- September, taking 21 cattle and 14 sheep with him.26 As in the previous year, he hired his nephew-in-law Willie Walker to help around the farm in his absence. This time round, Bowman gave Williet father $86 in total. On their return, they counted up the cheques, making $830 for the summer trip.alone. Bowman made a similar amount the following December, travelling to Winnipeg and the Manitoba Winter Fair in Brandon on his winter trip. On his various winter circuits over the years, Bowman had travelled as far as Ottawa, Sherbrook and Halifax.27 The result of Bowmant initative was a greater source of capital for him and his family throughout the war period. Throughout the War, Bowman recorded his voting choices for every election, offering a short description as to his reasoning behind each decision. When Samuel Carter, the Methodist, working class sympathizer, and Royal Knitting Company owner leÍt Guelpht mayoral ofñce to run for MPP of South Wellington in 1914, Bowman was sure to travel into town with Harry in order to vote for him.28 Carter won that year and remained in Provincial office until the end of the decade. What could only be described as the most important vote of Bowman's lifetime followed three years later during the Conscription Crisis. The Fat Stock Association also met fo¡ annual meetings, like this one photographed in 1910, to discuss regional and national cattle politics. James is at fiont on the far right. Image courtesy of Guelph Museums (2009.32.2957). Government polic¡ newspaper, and the local Methodist Church all vied to sway Bowman and the publict vote. The Guelph Mercury published maps of the frontline during the war; and later, during the 1919 General Strike, one headline declared "Soviet Rule Established at Winnipeg by Striking Unionists"34 Although the Methodist church had supported the war since it began, Bordent government went to extensive lengths to sway public sentiment of the need for wartime changes to Canadab society and economy. On top of his strong commitment to winning the war, Borden also enacted prohibition across the country in 1916, a policy which garnered party loyalty from teetotalling Methodists like Bowman. Yet by 1918, societal fatigue had taken its toll on the Canadian home front's wartime enthusiasm. Borden's legislation intended to instill fear and panic, to illustrate to political onlookers that the terrors of war could only be ended with victory. In 1917, it is questionable whether it was a fair election. Many of the sermons Bowman had heard over earlier years had been about wartime conflict. On Sunday 15 May 1915, Bowman and his daughters, fenny and Marguerite went "to Church. Heard Rev Mr. Yates preach on the 'Truth which abides and stands the stress and strain. Going to show that in this world war the truth and right would come out victorious. "'35 Methodism did more than solidify adherents' religious convictions. For wartime Methodists, it was the bedrock of small-town community formation, while also allowing adherents a voice to vent wartime gossip. As a rural farmer, whose family was shielded from being called up to the front, he had every reason to vote for Union on 17 December l9I7 . The following day, he wrote in his diary, saying "The Union Government got in by a good majority, about 50 members. We are pleased and thankful. "36 Only four months later in April 1918, Borden rescinded his government's policy to exempt farmers from conscription under the strain of recruitment shortages. James Bowman's wartime experiences illustrates that, contrary to some assumptions, farmers could be quite worldly. Where many in Guelph had never left the county, Bowman had more than travelled the continent. The image of profiteering which has most resonated with historians is the top-hatted businessman in a new automobile, or a group sitting around the table while they cut up the prosperify of the nation. Few think of a cattle farmer living with his family on the outskirts of small-town Ontario. lames Bowman's diary suggests the latter kind of unwitting 'farming profiteerl As with all diaries, each possesses its unique limitations. What Bowman's writing lacks in details is made up for in abundance. In total, he wrote nearly every day for 58 years.37 His entries are short and to the point; though with each reading comes greater clarity. Purebred farmers were at the top of the cattle raising hierarchy. They were expert hobbyists, making a living out of the professionalization of exhibition prizes. Influenced by scientific management, they bred cattle with great utility and 'purity.' War still affected those who could keep afloat financially. The Union government favoured farmers' essential to wartime production, and exempted them from some of the burdens of the war. By the end of the war, purebred farming was far more profitable than it had ever been before. The demand for high grade meat in a market of dairy cattle meant Bowman's upscale purebred sales were on the upswing. Western cattle feeders who understood the importance of purebred breeding to consumer markets thought with their bankbooks, and soon realized the profits available with enough outlay. The war accelerated cattle breeders place in Canada's complex rural hierarchy. Diaries are among the most important, but sadly underutilized sources for understanding community and local interpretations of national and international events. The future of Canada's social histories lies with them. Library and Archives Canada (LAC), 1921 Canadian Census, District 140, Sub-District 10, p. 13. UGA, XRI MS A737, Box 2, Vol. 5, November 27 l9I2-April26 1917. p. 113; and Personal Collection of Beverly Krone, Descendant of James Bowman, Elm Park Guelph, 1863-1944 prepared by Bruce T. Bowman, September 2015. UGA, XRI MS A737, Box 2, Vol. 5, Journals of |ames Bowman, November 27 l9I2-April26 19t7. p. 123. Margaret Derry, Ontario\ Cattle Kingdom: Purebred Breeders and Their World, 1870-1920. (Toronto: University ofToronto Press, 2001). p. 94. Adrian Gregory, The Last Great Wat British Society and the First World War. (Cambridge: Cambridge University Pres s,2008). p.225. 1 38- 1 53. (Toronto: University of Toronto Press, 2005). p. ru3. Robert Rutherdale, Hometown Horizons: Local Responses to Canada's Great War. (Vancouver: UBC Press,2004). Marga¡et Derry, Ontario\ Cattle Kingdom. p.91. Personal Collection of Beverly Krone, Descendant of James Bowman, Elm Park Guelph, tSO3- 1944 prepared by Bruce T. Bowman, September 2015. Guelph cicic Museum (GCM), 2012.68.46, Norfolk street Methodist church service program, 1923; and 1977.117.72, Norfolk St. Methodist Church program, 1924.
uGA, xRl Ms A737,Box 2, vor. 5, lournals of James Bowman, November 27 r9r2-Aprir26 1917. p.234. see, for instance, Michael Bliss, A canadian Millionaire: The Life and Business Times to sir loseph Flavelle, Bart. 1BS8-1939. (Toronto: MacMillan of canaäa, r978). LAC, 1901 Canadian Census, District 126. Sub_District 6, page l5; and 1921 Canadian Census, District 140, Sub-District t0, p. 13. As in other cases, Margeret Derry provides the best illustration of wartime pricing of cattle in her Ontario's Cattle Kingdom. Frederick crawford, Aberdeen Angus cattle in canadø.winnipeg: canadian Aberdeen Angus Association, 1944. p. xvi; and UGA, XRI MS A737,Box 2, Vol. s]Journals of James Bowman, November 27 t9|2-April 26 1917 . p. 234.
uGA, xRl MS A737, Box 2, vol. 5, Journars of James Bowman, November 27 r9r2-Aprir26 1917. pp.96-1 10.
uGA, xRl Ms A737, Box 2, vol. 5, lournals of James Bowman, November 27 r9r2-Aprir26 l9l7 . p.78. uGA, xRl MS A737, Box 2, vol. 5, Journals of )ames Bowman, November 27 l9r2-Aprir26 1917. p. ls2. UGA' xRl MS A237, Box 2, Vol. 5, Journals of James Bowman, November 27 r9r2-Aprir26 l9r7 ' p' 21 l; Bowman makes mention of each of these organizations and to some extent his involvement in it. He typically focused the organizations iole on community outreach and as a network ofinformation to keep him involveed in local and regional agriculíural events. uGA, xRl MS A73i, Box 2, vol. 5, Journars of James Bowman, Novelber 27 r9r2-April 26 1917. p. 158. Frederick Crawford, Aberdeen Angus Cattle in Canada, p. 2g. UGA' xRl Ms A737, Box 2, vol. 5, journals of James Bowman, November 27 r9r2_April26 1917. p.115. The Guelph Evening Mercurl, August l5'h l9l4: p. 4; and Dawn Matheson and Rosemary Anderson, eds. Guelph: perspectives on a Century of Change. p. I5g. Robert Allen Rutherdale, Hometown Horizons: Local Responses to canada,s Great war. p. r30; andThe Guelph EveningMercury,15 May l9l5: p. 1. Desmond Morton, A Military History of canada, r36. and carol Lee Bacchi, Liberation Defened? The ldeas ofthe Englßh-canadian sufragists, ig77-i91g. (Toronto: university of Toronto Press, 1983), 39. The Guelph Evening Mercury, May l0 l9l9: l; and May l grh 1919: p.I . UGA, XRI MS A737, Box 2, Vol. 6, Journals of James Bowman, April 28 1917 - September 19 1921 . p. 37.